Easily Convert MP4 to Windows Movie Maker Supported Format to Successfully Import MP4 to WMM for editing. When try to import MP4 to Windows Movie Maker, only to find Windows Movie Maker cannot even recognize MP4 video let alone to import and edit MP4 in WMM. Until now, Windows Movie Maker only imports WMV, ASF, MPG (MPEG-1), AVI (DV-AVI), WMA, WAV, and MP3. Importing of other container formats such as MP4, 3GP, FLV, MOV, MIDI, AIFF, AAC and SWF are not supported even if the necessary DirectShow decoders are installed. In order to successfully import, open, and edit MP4 in Windows Movie Maker, we had better convert MP4 to Windows Movie Maker supported video formats like WMV. 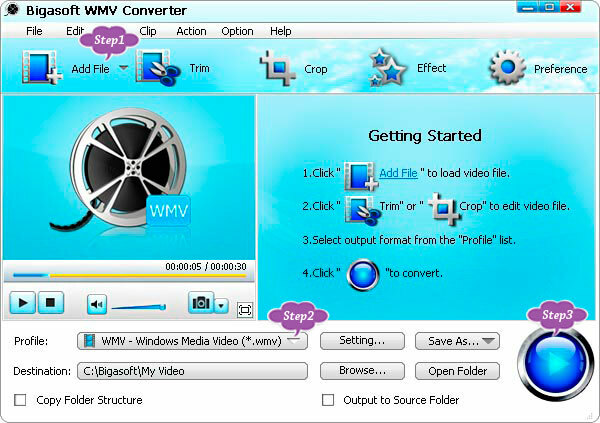 The following will introduces a powerful MP4 to WMM Converter and a step by step guide on how to convert and import MP4 to Windows Movie Maker. Free download the professional MP4 to Windows Movie Maker Converter - Bigasoft WMV Converter (Windows Version, Mac Version), install and run it, the following interface will pop up. 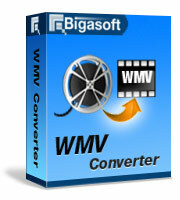 As the professional MP4 to Windows Movie Maker Converter, Bigasoft WMV Converter can easily convert MP4 files to WMV, AVI, ASF, MPG, MP3, WMA or WAV for fast import MP4 to Windows Movie Maker. This powerful MP4 to WMM Converter also helps to convert and import other video or audio formats including WTV, MKV, VOB, H.264, FLV, MOD, TOD, MXF, MTS, AVCHD, FLAC, OGG, APE and more to Windows Movie Maker. Click "Add File" button to import MP4 file to this powerful MP4 to WMM Converter. Or just simply drag and drop the MP4 file to the main interface of this software. If you want to only import the audio from MP4 to WMM, then select Windows Movie Maker supported audio format like WMA - Windows Media Audio(*.wma) from "General Audio" Category. Click "Convert" button to finish the MP4 to Windows Movie Maker format conversion. Open Windows Movie Maker, on the File menu, you can choose Import into Collections or Import Media Items to import the converted MP4 file to Windows Movie Maker.